Earn up to 8,245 reward points. The definitive collection of NI instruments and effects with over 100 products. The KOMPLETE collection of instruments and effects has, and continues to define the signature sound of world-class producers, composers, musicians and sound designers. 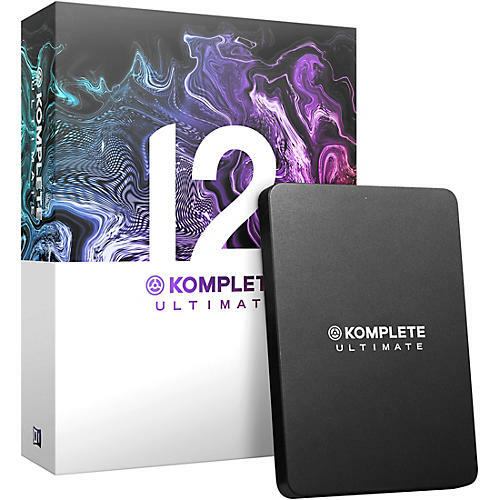 KOMPLETE 12 ULTIMATE is the definitive resource for professional production, scoring, performance, and sound design. This collection contains 100+ premium instruments and effects – from cutting edge synths to symphonic sample libraries including KONTAKT 6, SESSION GUITARIST - ELECTRIC SUNBURST, and THRILL. Also, included in KOMPLETE 12 Ultimate are 20 Native Instruments Expansions, which are genre-specific sound packs loaded with synth presets, drum kits, one-shots, samples, and loops. Created by top artists and sound designers, Expansions can be used in any DAW and work with a range of Native Instruments products, including MASSIVE, BATTERY 4, and MONARK. KOMPLETE 12 raises the bar for production, performance, and sound design in any genre.